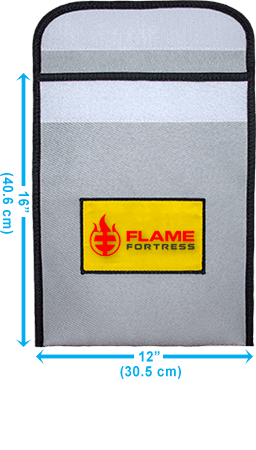 Made from the highest quality materials and at 12" x 16" (30 cm x 40 cm), it has plenty of room to protect all of your important documents and other valuables from fire. 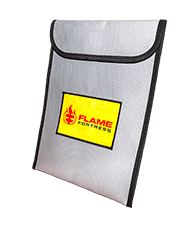 What makes this the best fire-resistant document bag available on the market? Made from the highest quality heavy duty materials, including tightly woven fire-resistant fiberglass, with double-sewn edges and treated fabric. 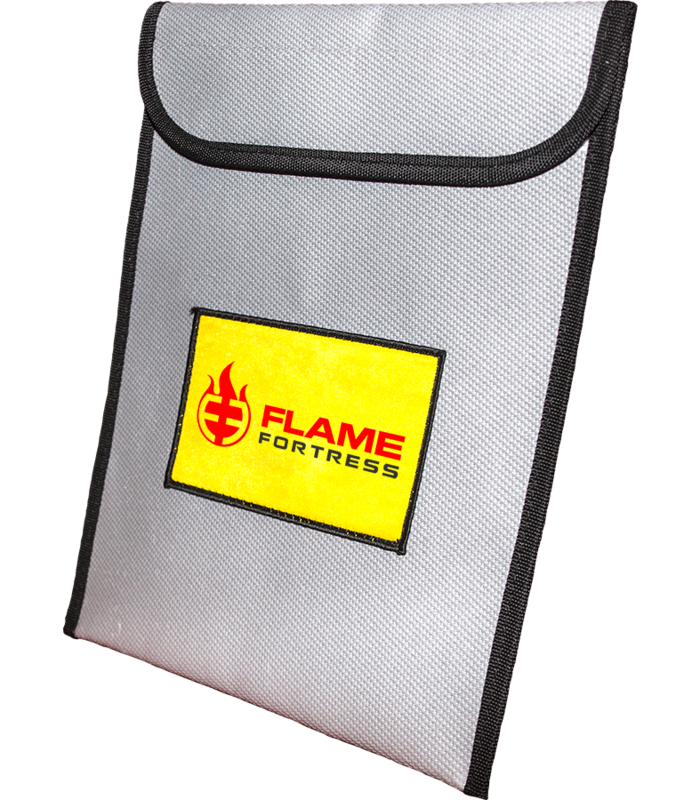 Unlike expensive, large and clunky fireproof safes, our fire-resistant bag is inexpensive, and can be stored easily anywhere in your home or office. 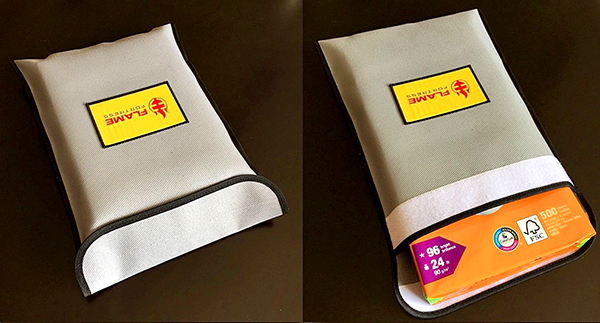 At 12" x 16" (30 cm x 40 cm), it holds legal & A4 size documents and has plenty of room to protect all of your important documents and valuables from fire. All of our bags are guaranteed to be free of manufacturing defects. If there are any issues, we will provide a full refund or send out a replacement free of charge. Protects your documents from fire. Water proof surface material also protects against water damage. Competitive bags are made from raw white fiberglass, which can cause severe skin irritation. Our bags are coated to reduce irritation. No gloves needed. Simply insert your valuables into the bag, and secure the convenient extra-wide Velcro® closure. For greatest protection, store in a lower level of your home or office. Give the gift that everyone needs. Give the peace of mind that comes with knowing that valuables are protected from fire. It's a huge 12 inches x 16 inches (30.5 cm x 40.6 cm). Can easily accommodate legal & A4 size documents and numerous other valuables. It's even big enough to hold a laptop! Made from the highest grade fiberglass, inside and out, to provide the highest protection. Unlike many competitive products that only coat one side of the bag. Can withstand the highest of temperatures. Protect the valuables you can't afford to lose. Some customers use this bag inside of a safe or safety deposit box, providing a second layer of protection in the event of a fire. The bag lies flat, so it's easy to store anywhere in your home or office. Flexible enough to be folded into tight spaces. If you are not satisfied with the product (you would be the first! ), simply return it to obtain a full refund. No questions asked. Safeguard all of your important documents and valuables from fire. Easily holds multiple documents and other valuables. Just stack them up and slide them in. Protects your documents from heat and flames. Tightly woven fire-resistant fiberglass, with double-sewn edges and treated fabric. Is the bag really fireproof? Is it guaranteed to protect against any fire? Has the bag been lab tested for fire resistance? Absolutely! The bag has been tested by an independent lab to two different North American fire standards. All tests passed. More specifically, the material meets the performance criteria of the Standards Council of Canada CAN/CGSB-155.1-2001 Standard for protection against heat and flame, and meets the flame propagation requirements of the National Fire Protection Association NFPA 701-2015 Standard. How many sheets of paper can the bag hold? A lot! It's a huge 12 inches x 16 inches (30.5 cm x 40.6 cm) in size. The bag lies flat to start, so it doesn't really have much depth, but the sides expand as items are placed into the bag. Let's put it this way, it easily fits an entire package of 500 sheets of letter sized (8 1/2 inches x 11 inches) paper. Yes we do! Our bags ship from our distribution center in Canada, but we ship to any country in the world. Shipping costs for your location are shown below, and are also calculated at checkout. How quickly will I receive the bag? We ship within 24 hours of receiving your order, using standard ground postal mail. You should expect to receive your bag within 2-3 weeks of placing your order. If you require faster shipment using courier services, this comes at an extra cost, so please contact us. Can you handle bulk purchases? Yes, we would be happy to fulfill your bulk purchase order. Please contact us with your requirements. 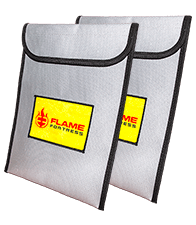 Read what our customers have to say about the Flame Fortress® fire-resistant document bag. This is a very high quality product. I have no doubt that it will help to protect my childhood photos from fire. And it doesn't cut my hands like another fiberglass bag I purchased. I use this to store my Will, deed to my property, and all of our family passports. I actually tried to light it on fire using a propane torch, and it did not burn. I hope I never need to find out how well this bag performs in a fire, but it is a very well-built, heavy-duty bag. I bought two and gave one to my grandmother --- she loved it! I was looking for a fireproof safe but found this bag instead. This is a much better solution for me. Much cheaper, big enough to store legal documents without folding them up, portable, and I can store it out of sight in a drawer. Highly recommended. Buy the original Flame Fortress®. The Ultimate Fire-Resistant Document Bag. A Must Have for Any Home or Office. High quality 12" x 16" (30 cm x 40 cm) fire-resistant bag. Protect the valuables you can't afford to lose. Two bags, for protecting multiple valuables. Or give the second one as a gift! The Ultimate Fire-Resistant Document Bag. ® "Flame Fortress" and the Flame Fortress logo are registered trademarks of Flame Fortress Inc. All rights reserved. All Rights Reserved by Flame Fortress Inc.